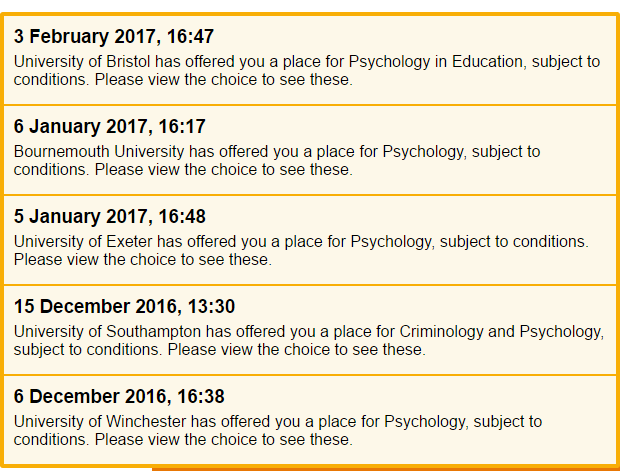 When I sent off my UCAS application, I told myself that I would be happy with just one offer. This was because it had been drilled into me that I was being overly ambitious with my university choices and predicted grades so I would be lucky to get offers. On the 3rd of February, I received an offer which I actually didn't think that I was going to get because it had taken so long to come through and I just didn't have much faith that I would get an offer. So, when I got that heart wrenching email from UCAS to check track, I felt like crying with happiness when I saw that the University of Bristol had given me a conditional offer of BBC; lower than the typical grade. I visited Southampton university again last week and it's safe to say that I loved it, loved it so much that I started having a huge dilemma about where I actually wanted to go but albeit Southampton being lovely, I think I have decided on Exeter as my firm and Bristol as my insurance but I'm not setting anything in stone yet because I want to be absolutely certain(obviously). As for the rest of A Levels, it's not getting any easier but I booked a holiday to Berlin with Josh for the end of exams which I'm really looking forward to because it's giving me something to look forward to and pull me through the next couple of months which probably have the ability to kill me. How's your February going? If you've applied for uni, how's your application going?